On 22 June 1941 Nazi Germany attacked the Soviet Union. The Polish government-in-exile in London, under the leadership of General Sikorski, concluded a treaty on 30 July 1941 with the Soviet Government. The treaty led to the Soviet leader Stalin releasing from captivity all the Polish citizens (one and a half million) who had been deported from Poland to imprisonment in Soviet labour camps and exile in Siberia and Kazakhstan. A Polish Army, under the command of General Anders, was to be formed on Soviet soil in order to fight the Germans. Help the Command of the Polish Army. Watch over the Soviet Government's fulfilment of the Polish-Soviet treaty. Dispel the inveterate Russian prejudices against the Polish government. Emphasise the heroism of the Polish forces on all fronts. Urge the extraordinary propaganda value of a reconciliation between the USSR and Poland. The Polish ambassador also wished to discover what Soviet intentions were towards the Poles and their view of the Polish role during and after the war. The high point of Polish-Soviet relations was the visit by General Sikorksi to the Kermlin in December 1941. During his time as Ambassador from September 1941 until July 1942 Stanislaw Kot had a number of conversations with representatives of the Soviet government. These were principally with Viacheslav Molotov (Commissar for Foreign Affairs) and Andrei Vyshinsky (Vice-Commissar for Foreign Affairs). Dispatches based on these conversations were sent to the Polish government-in-exile in London. Molotov: What is the position in regard to the arming of the Polish Army? Kot: I understood Russia...would supply the arms. Kot: So if I have understood you alright, we can form as many divisions as we have people for, on condition that we obtain equipment and food supplies from abroad. Stalin: You have understood me perfectly. Stalin: ...it will not be Uzbekistan, to which place Polish citizens are travelling illegally. Kot: Uzbekistan was not our idea, but was indicated... by the Soviet military authorities. 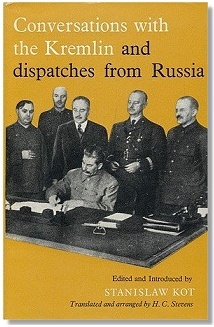 Stalin: Are there still Poles not released? Kot: We lack the officers from Starobielsk, Kozielsk, and Ostashkov, who were transferred from those camps in April and May 1940. Sikorski: I have with me a list of some 4,000 officers who were carried off by force and who even now are still in prisons and labour camps...Those men are here. Stalin: That's impossible. They've fled. Anders: But where could they flee to? Stalin: Well, to Manchuria, for instance. Sikorksi: ... The conditions in which the Polish Army is now being formed are quite unsatisfactory. The soldiers are freezing in summer tents, they feel the lack of food and are simply condemned to slow death. For this reason I propose to transfer all the troops...to Persia...I am ready to make a declaration that these troops will return to the Russian front and that they might even be reinforced by several British divisions. Kot: Taking the Soviet Union's difficulties with food supplies into account, we would like to organise the mass transfer of Polish children abroad...there are about 160,000 children, Polish citizens, in the Soviet Union...The constant mortality among the children, their mass mortality, is a painful thing. On 22 July 1942 a message was sent to Ambassador Kot in Teheran telling him that the Soviets had abolished all the Polish delegations as they had engaged in hostile activity and espionage instead of welfare. In April 1943 the Soviet government broke off diplomatic relations with the Polish government-in-exile after the discovery, by Nazi Germany, of the buried remains of thousands of Polish officers at Katyn in Russia. Publisher - Oxford University Press in 1963. This page was added on 11 March 2012.